Plot: Abner and Charlie enjoy the views as Pompeii is engulfed in lava, escaping the doomed citizen at the last-minute via a tractor beam that takes them back to the shuttle of ‘trans time’ a company the specialises in time-travel holidays. They then plump for watching a witch-trial in medieval England but, finding the proceedings a bit dull, decided to use the tractor beam to levitate above the crowd and ‘play the witch’. Shock: As they taunt the Witch-finder General their beams fail and Charlie and Abner plummet to earth, to be seized and burnt at the stake. As they die their comms device from the holiday company apologies for the technical failure and promises it will be remedied in the hour. Thoughts: The first example of a Future Shock failing in terms of its own internal logic – the holiday company offers time travel and then, when there is a technical error resulting in the death of their clients, it should be obvious the company can just go back to before the accident and avoid the problem. Time travel is, of course, prone to this sort of problem in narrative determinism and sometimes it has to be indulged but here, when there is little else to hang the story on and not enough room to say why the company can’t deal with the deaths this way, it becomes an over-bearing problem. The story is both more of a Terror Tale (Charlie and Abner’s fates are pretty grisly) and a Time Twister before these titles were used in 2000AD. As a Future Shock concept it’s simply not very good. Horacio Lalia produces one or two fine panels but much of the work lacks the quality he brought to A Promised Land! in the previous issue and the inking, along with the credit to ‘panacomics’ would suggest he wasn’t the sole artist working on the visuals. Peter Harris’ concept may not have been up to much but he nails the casual speech of the slobbish Abner and Charlie (‘not us sucker, we’re movin’ on’) and gives some fun names during the witch-trials (Seth Wormtree, Goody Twynham). There is a real efficiency in his writing to be commended; in 16 panels he goes from the destruction of Pompeii to a meeting with the Time Travel company to the confrontation of the witch-trials and its fiery outcome. Shock’d? 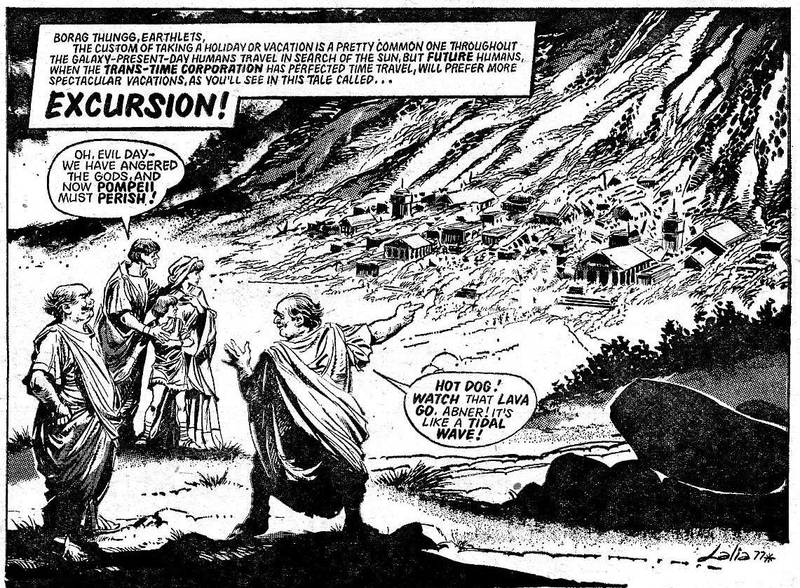 There is no real shock to speak of as the reader immediately thinks that time-travel would save our callous protagonists but as an early Terror Tale it makes good reading with three burnings at the stake and Pompeii destroyed in a short four pages. There is talk of a money-back guarantee littered throughout the script which is clearly meant to have more import than it actually does. Nobody is shocked if a consumer warranty isn’t up to much, are they? PROG: 31 – A PROMISED LAND! Plot: On an over-crowded future earth the authorities announce they are giving away free tickets to a new paradise planet. Jed Orville, thoroughly sick of earth, beats his way to the front of the queue, having learnt from his thuggish friends that is how they got their tickets and having seen the rich buy their way on to the flight passenger manifest. Two weeks later Orville and his pals are on their way to paradise. Shock: The ship beams down the passengers to ‘a frozen hell’ where they will have to learn to cooperate or die. Everyone on the flight was a bully or a cheat just like Jed. Thoughts: A Promised Land, with its dystopian world view, nasty central characters, highly individual dynamic art and thoroughly mean conclusion could probably claim to be the first Future Shock to represent the elements 2000AD was to become famous for. Jed Orville is an excellently unpleasant lead and his dialogue if full of great phrases, ‘Man, am I sick o’ dis place‘, which instantly lifts the story away from the more Golden Era’ Sci-Fi of previous Shocks. Lalia’s artwork is simply wonderful with scores of detail on the poor saps around Jed – women and babies get pushed out-of-the-way, brides cry about their misfortune and brutish men with muscles or money parade around with smug contentment. There is a slight continuity error whereby Jed’s friends claim to be booked on a flight ‘tomorrow‘ but end up on the plane with him ‘two weeks later‘ but that’s forgivable.. maybe Virgin ran the flights. Listed as ‘unknown’ it seems likely that Peter Harris is on scripting duties as Jed’s dialogue is strongly reminiscent of that of the time travellers in the Future Shock he is credited for in the very next issue. The characters in both strips share a 70’s American street vernacular written with an ear for the phrasing and slang of the times. Whoever the author of A Promised Land! is they deserves praise for a classic Future Shock. Shock’d? Not overly as just how mean everyone on the flight is has been blatantly telegraphed; however the joy in the script and art is the meanness of all the characters and their eventual fate – especially as they are teleported right beside a very hungry looking sabre-toothed tiger-creature. Plot: A massive starship drops out of warp on the edges of a planet responsible for a failed attempt to destroy every other species in the galaxy. The crew take evasive action to avoid the debris of war and the still active missile defence system. A crew member ponders why the combined allies had not destroyed the source of such an evil genocidal race when they had finally defeated them.. Shock: The ‘most warlike species the galaxy has ever known‘ is the human race! The captain tells his crew, and the stare in amazed agreement at the planet, that Earth was the most beautiful planet and so paradoxical it should spawn such evil as humans. Thoughts: A similar theme to both King of the World (Shock 1) and Food for Thought (Shock 2) of ‘man is a violent creature’ comes back and is nicely disguised by the alien species in the craft having a humanoid form, including a rather foxy blonde crew member in a 60s Star Trek style mini-dress, but, as revealed in the final panel, having rather lupine hairy forearms and claws which had been kept out of sight. 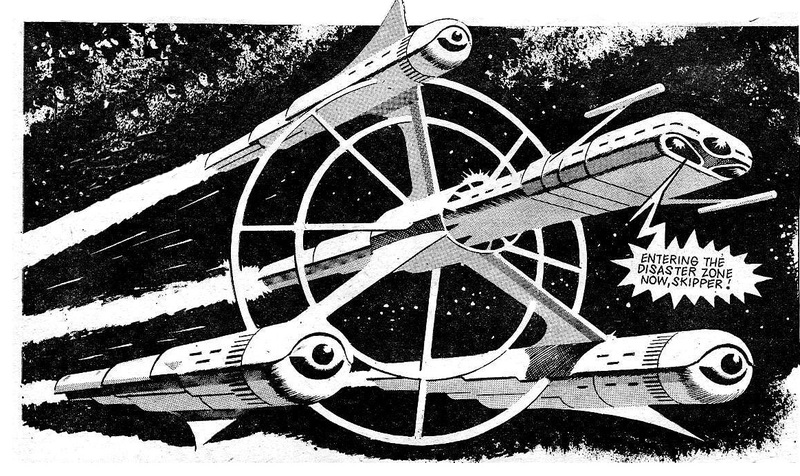 That similarity of theme points to the ‘unknown author’ being Steve Moore however Peter Harris could also be a candidate due to the 50s Sci-Fi feel and the use of a non-relevant dramatic tension device (the attack by the missile system) making it strongly reminiscent of the previous Prog’s story Just Like Home. Either way the tale shares that story’s ‘classic golden era’ sci-fi feel although it lacks it warped nasty final imagery, instead going for a Gene Roddenberry preachy ending. Ron Turner’s art gives good space ship and even better Space- hottie; even if she is a wolf. Shock’d? After a two page build-up of just how horrible the genocidal species have been it’s not a huge shock to find out it’s mankind; there is not a lot else it could be unless they discovered Santa’s home-world had gone homicidal. In addition the fact that our role as ‘the most warlike species ever’ and the crew’s non-human form are revealed in the last half-splash page tends to lessen the impact of each – the impact of the lupine claws is slightly diminished by the heavy prose and the huge central image of earth, even though they are front and central on the page. However like Just Like Home the story has a good visual dramatic tension with the missile fight so it works nicely as a story if not a particularly shocking one. Plot: Tex and Mitch land on a earth-like planet after four years using an experimental warp drive. Unsure of their precise location they are shocked to find branded cattle just as they would in Texas. After an initial confrontation with two lizard-like ‘cowboys’ the four settled down to enjoy beans by the camp-fire before Tex and Mitch leave to continue their space voyage. Shock : As the astronauts depart the two lizard cowboys debate whether they should have told the two humans that they had come ‘full circle’ back to an earth 50 years in the future and that mankind was ‘reduced to zombies’ by germ warfare. Thoughts: A classic 50’s Sci-Fi feel pervades this excellent strip, down in no small measure to Ron Turner’s excellent traditional art. Peter Harris, the neglected author of the ‘first’ Dredd story in Prog 2, turns out a bobbins tale that doesn’t make a lot of sense (experimental warp drives given four-year missions, navigation units being accepted as unreliable) and a description of the human condition ‘reduced to zombies’ which doesn’t match the images (the lizard cowboys ride off on hairy human-faced ‘horses’) but still it works because yes those are bonkers aliens in Roy Rodgers gear and yes that final human-horse-wildebeest image is just so weird and wrong and magnificent. 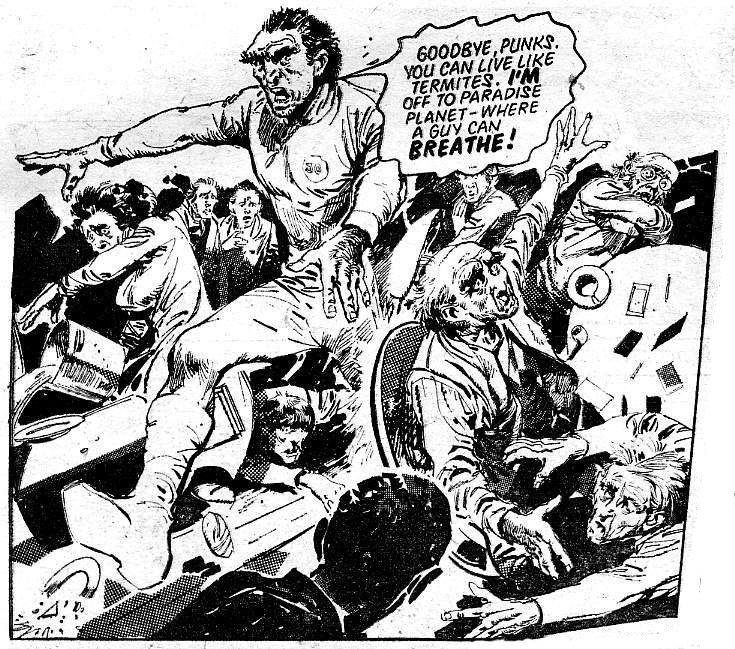 And also because, lets face it, this is ‘The Last Rumble of the Platinum Horde‘ rendered as Charlton Silver-Age Sci-Fi five years ahead of Mr Moore’s more famous piece. Shock’d? Most certainly. 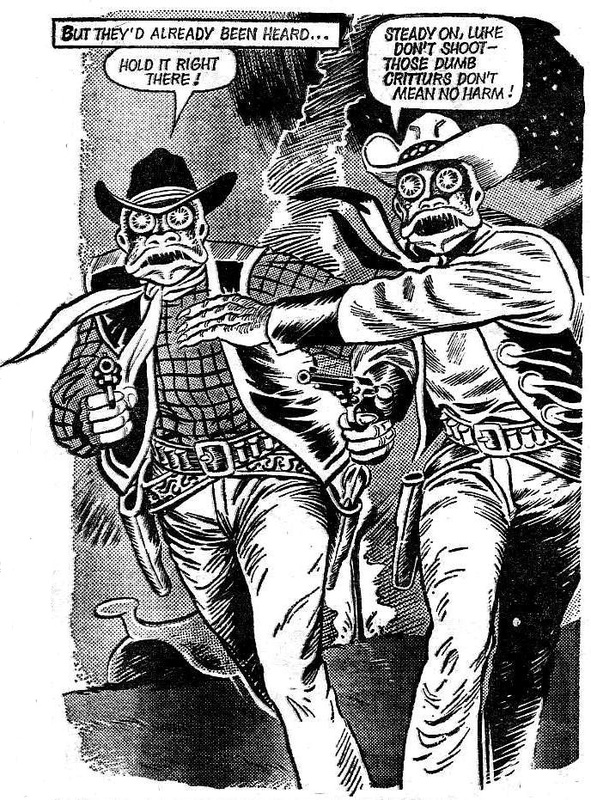 The story has its own separate tension, mainly the initial confrontation with earth’s new cowboys which seems sure to end badly for Mitch and Tex, and the Shock is totally bonkers and unexplained (who are these lizards?, why are they so happy to let our heroes go when they ride human-slave animals? , why are they dressed like RKO serial extras? and what’s the whole zombie thing about?) but still all is forgiven for that last panel of the pained human-horse-Sasquatches looking so miserable.